Although many of us are aware that coral reefs around the world are threatened by various factors, the fact seems fairly unrelated to most of our daily lives. However, the truth of the matter is that globally, although in some regions more than others, coral reefs can be major contributors to the economy. This may not be such a surprise when we think about an image of a bright and healthy coral reef ecosystem, which tends to be very visually busy with all of its living and non-living members. It makes sense then, that coral reefs are actually able to provide us with quite valuable and widely used resources. For example, there are many kinds of seafood which can be gleaned from coral reef environments, with reef-related fisheries making up about 9-12% of the total fisheries worldwide¹. Additionally, many pharmaceutical companies are taking advantage of the high biodiversity found in coral reef ecosystems which includes many organisms that possess beneficial medicinal properties¹. 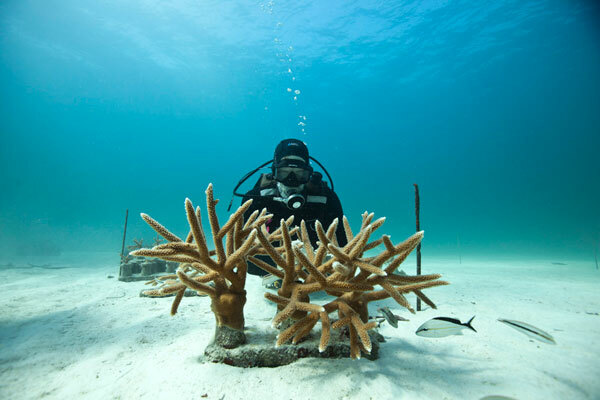 Coral reefs also are responsible for providing us with services such as protection from erosion. In the Pacific Island countries and territories, for example, the reefs in the area not only protect the coast, but also is home to some of the largest tuna fisheries in the world². In the Southern Ocean region, coral reefs are important fisheries, as well as sources for the growing market of health supplements, and are major attractions for tourists². The economic contributions of coral reefs is so vast in fact, that initiatives have been put in place to restore reefs in various places, including Florida and the Caribbean³ (Image 1). Several organizations have partnered together to ensure the longevity of coral in these areas in the future (Image 2). To put some numbers with it, the value of one hectare of coral reef has been calculated to provide an average of $130,000 worth of services with the highest calculated value resting around $1.2 million¹. In other words, coral reefs have so much more to offer than simply being aesthetically pleasing, and whether we are aware of it or not, they provide us with resources that help our economies flourish, and allow for us to live the lives we do. 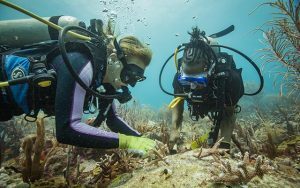 Marine biologists restore reefs near Grenada by planting young corals. Ken Nedimyer, a marine biologist, observes the state of staghorn coral near Key Largo, Florida. ¹ Moberg, Fredrik, and Carl Folke. “Ecological goods and services of coral reef ecosystems.” Ecological economics 29.2 (1999): 215-233. ² Cavanagh, Rachel D., et al. “Valuing biodiversity and ecosystem services: a useful way to manage and conserve marine resources?.” Proc. R. Soc. B. Vol. 283. No. 1844. The Royal Society, 2016. ³ “The Nature Conservancy.” The Nature Conservancy. N.p., n.d. Web. 20 Feb. 2017. <http://www.nature.org/ourinitiatives/regions/northamerica/unitedstates/florida/newsroom/initiative-to-restore-one-million-corals-launches-in-florida-and-the-caribbe.xml>. ¹ Diversitas. “What Are Coral Reef Services Worth? $130,000 To $1.2 Million Per Hectare, Per Year.” ScienceDaily. ScienceDaily, 28 October 2009. <www.sciencedaily.com/releases/2009/10/091016093913.htm>. This entry was posted in Uncategorized and tagged 2017, economy, Marcella, resources, value. Bookmark the permalink.